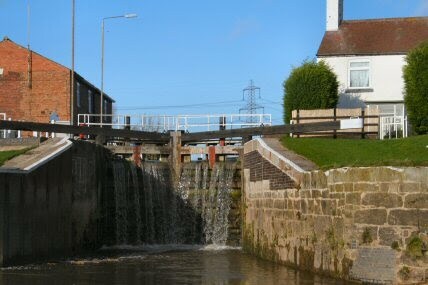 At 0810 I was in the lock at Torksey and Neil, the lock keeper had already let one boat through that was heading for Cromwell Lock. 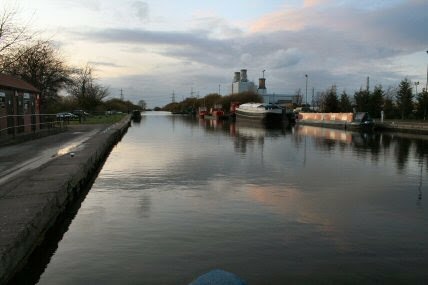 I was asked as I left to let the two boats that had moored outside the lock yesterday, having come down stream, know that it was time to go. 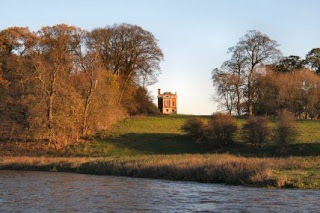 The first piece of interest on the Trent is the the ruins of Torksey Castle. I was soon overtaken as I still have my doubts about the engine and don't feel inclined to give it the gun. One boat was heading for the Chesterfield Canal and the other was making, like me, for Keadby. There are a number of scenic views on the way and one of them is the very French looking folly that is called Burton Chateau. 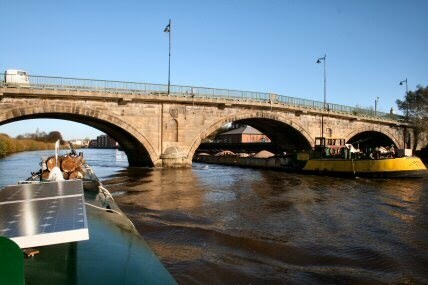 The corners along here are taken at speed and the boats leans quite a way over as they are rounded. The village of Knaith comes next. One of the days I will visit the church as it looks rather unusual. It is wider than it is long by the looks of it and has two gable ends side by side. More excitement when the carrier - Fusedale of Hull caught up with me on a bend. I slowed down to let him through and pulled in to the inside of the bend. 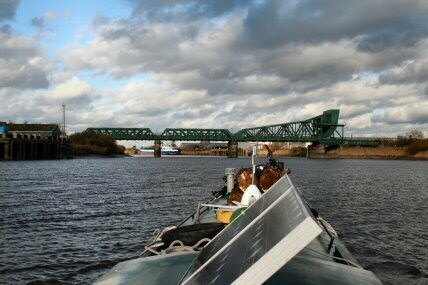 As we rounded the bend straight in front was the bridge at Gainsborough. I normally go through the centre arch but as he would need it I took the left hand one and hoped that it was deep enough. It was. 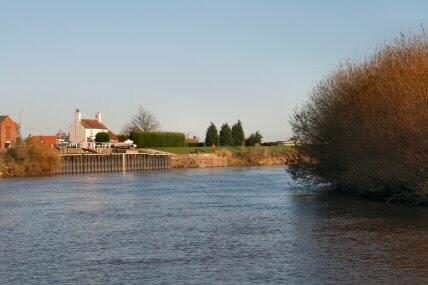 A few hours after leaving Torksey I passed Stockwith Lock. No sign of the boat so he must have made good time. However as I passed I noticed the amount of water going over the gates. Remember this. Nearer and nearer to the lock and the lift bridge with road and rail traffic. Pity it has stopped opening. 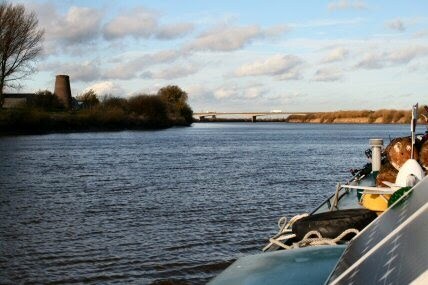 Getting into Keadby is bit of a trial. It is no good trying to get straight in with the speed of the ebbing tide. When along side and heading straight for it one turns up stream and then has to go full ahead to make any headway. Managed to just get round the corner but slight problem with the sand build up outside. The other boat was inside and had had to wait till I arrived. Here the problems began. 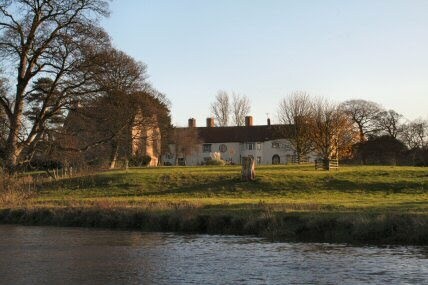 Normally the lock keepers are brilliant. This one was having a very bad hair day it seemed. As I got into the lock and the gate closed behind me I didnt have time to sort out the ropes and there was no one to pass a rope to on the lock side before the gates closed and the sluices opened to fill the lock. The water from the sluice rushes under the boat, hits the sea gates and then pushes the boat forward. 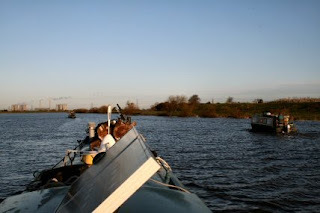 With the engine going full astern and me pushing and pulling like an idiot the bows are stuck against the gates. 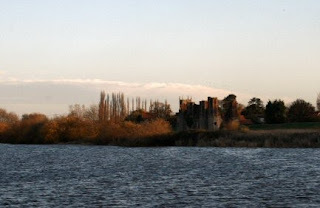 Remember the water at Stockwith. A similar situation was happening here. The water cascaded into the bows and filled the well then over flowed into the boat. Not as bad as it might have been for a number of boats in the past have been sunk by this sort of thing happening. I did think - Pillock - or words to that effect. I did have a word with the lock keeper and suggested it might be a good idea to make sure boats are secure before opening the sluices. The next two hours were spent mopping up. The fire is now lit and all windows closed and is like a sauna. Just what I needed. More on the other boat later. We will travel to Thorne together as it is easier to operate bridges with two people. 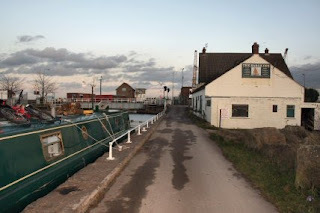 Nice to hear you made it safely but sounds like you had a nightmare in Keadby Lock. As you say it could have ended up much worse than that. Three hours to West Stockwith is a little leisurely though. Give us a shout next time and we will tow you there in two!!!! And how did you know i would laugh?